£26.00 each & FREE Delivery in UK. 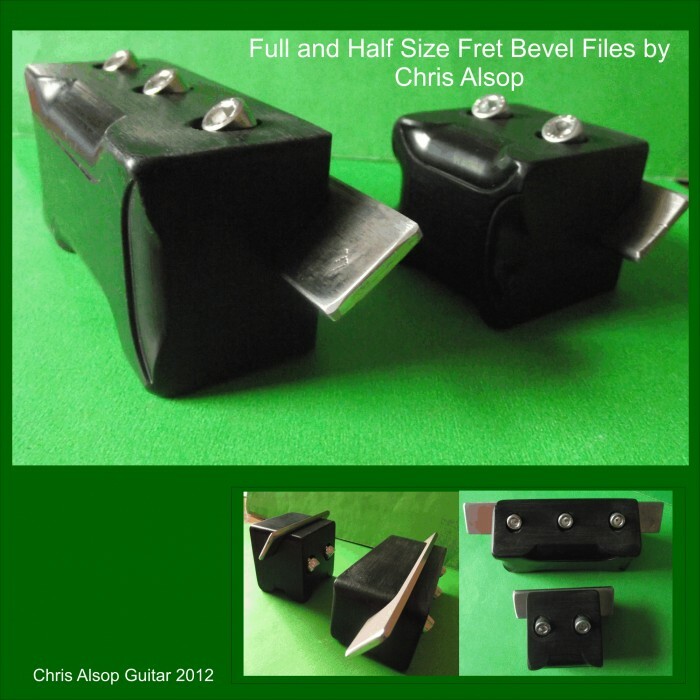 The device is made in our workshops by Chris Alsop and provides an efficient and easy to use solution to getting the fret ends cleanly cut to a specific angle. We have experimented with many designs for these and have come up with this solution. • For filing the ends of the frets level with the ends of the fretboard the file can be set at 90 degrees. 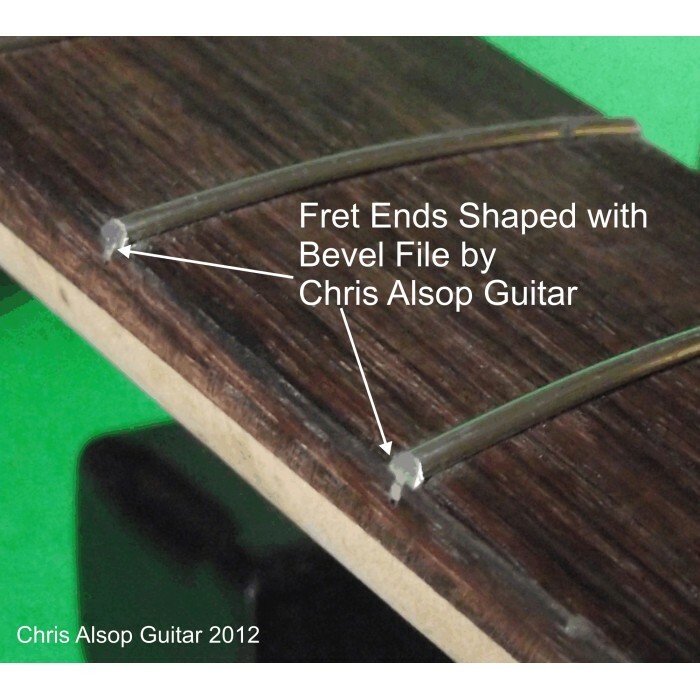 • For beveling the fret end at 35 degrees the file can be set accordingly. Easily accessible allen bolts clamp the file securely in either position. Advantages of using a Bevel File are that a really consistent professional job is achieved where all the fret ends are at the same angle. 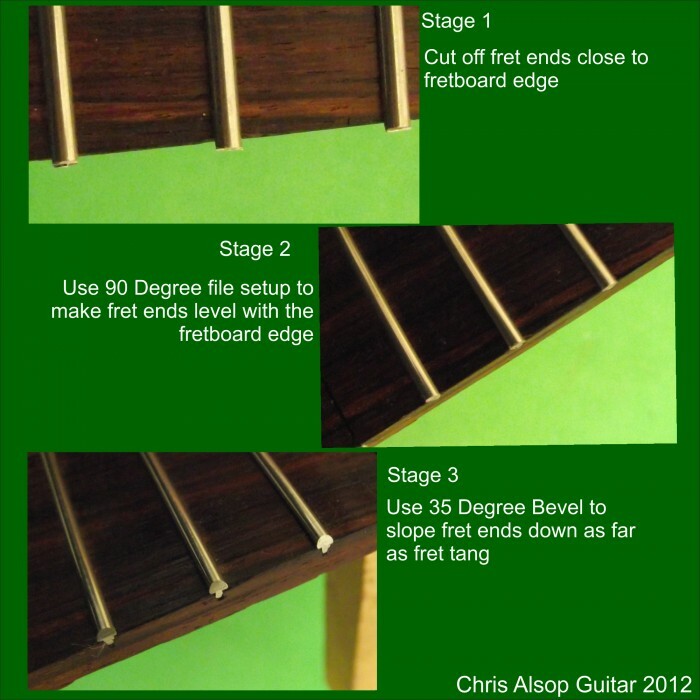 This main point about bevelling is to make sure there are no sharp edges or uncomfortable fret ends which hamper playing; if a fret end is too long then it disturbs the feel of the neck as the players moves around the fretboard, if the fret end angle is too shallow then the string can easily start to slip off the end of the fret. It is also suprising just how much of the fretboard space is used up by the bevels - a 45 degree bevel will use about 1mm of the fret wire and so reduce a 43mm neck to 41mm playable width. These bevel files can be made to any angle as low as zero and to a maximum of 60 degrees. The bevel file is a fine grit diamond file which leaves a good finish - see the close up photo - and all that is needed is the final light sanding to remove any scratches or uncomfortable edges and finaly a polish - and the job's done.